When tS recently told me that we needed to go to Takashi after he had an abbreviated visit, I happily obliged. Who am I to deny a man his meat? Plus, it’d been on my radar for well over a year. While we browsed the menu, a few plates were brought over for us to munch – kimchi, a tall pile of well-dressed cabbage, and bean sprouts. A nice and light accompaniment to the very meat-centric meal we were about to have. I think this was brought over to us because tS actually knows the manager – he came over and said this was a big Valentine’s special (we went the Tuesday after Valentine’s Day) – beef heart chili over cheese mochi. The chili was a touch too spicy for me, but the mochi was super chewy and very delicious. I’ve never had savory Japanese mochi (though I have it in other cuisines a lot), and definitely not with cheese. tS liked this dish a lot – he definitely eats spicy more than I do. Then the parade of all the things we ordered began – fun fact: I like hanging out with people who don’t discourage me from eating as much I want, and who will eat along with me. 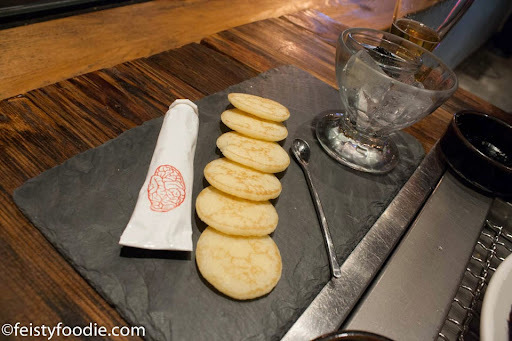 And adventurous eaters, because going to a place like Takashi that specializes in offal? you KNOW I’m going to make you eat everything and anything that sounds delicious, even if it’s BRAINS. Niku uni – sheets of seaweed topped with shiso, a raw slice of beef, then uni. We were directed to top with a bit of the wasabi, then roll up and eat. I LOVED THIS. The varying textures from the airy, crisp seaweed, the shiso leaf – which is hard to describe, but tears like a very sturdy lettuce – the meaty chew of the beef, and then the creamy salt of the uni with the slightest kick from the wasabi… just heaven in each mouthful. The interplay of everything just worked perfectly for me. However, tS didn’t care for the seaweed at all. I believe this was the seaweed more commonly served in Korean cuisine, which is texturally slightly different from the Japanese seaweed commonly used in sushi. Yooke – though I didn’t get a before picture, this came as a tangled pile of beef with the cutest little quail egg on top before our server, Brittany (who was super helpful and an absolute delight the whole night), mixed it all up for us. The beef was cut into thick ropes, which gave a completely different mouthfeel to most tartares I’ve had – forcing the flavor of the meat to be the star. I thoroughly enjoyed each well-seasoned strand, and knowing that tS had eaten this last time and wanted to order it again, my assumption is that he also enjoyed it. 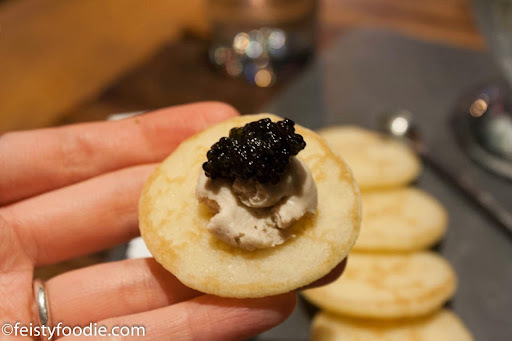 Calf’s brain cream in a tube with caviar and blinis – yup, I “made” tS eat brain. Inside the tube was a very, very creamy light brown spread that I squeezed onto each blini, then topped with a bit of caviar from the bowl on ice. While the flavor was mild – I’ve eaten brain in the past, and it seems to have very little of its own taste – the caviar boosted a bit of salt in there. And while the idea is novel… the tube is cute… and it’s a nice introduction for people who want to try eating brain… overall, this dish fell super flat for me. It just failed on the textural level; everything was way too soft. I wanted something crisp to mix it up – maybe some chives or shallots (classic accompaniments to blinis and caviar), but then the brain could be viewed as simply a replacement for creme fraiche. Essentially: the dish was inoffensive, novel, but not something I’d seek to repeat. 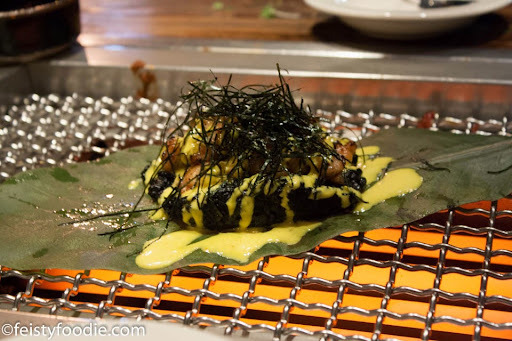 This was the only dish not picked by me (teehee…) – squid ink rice with miso marinated sweetbreads, spicy yuzu aioli, served on a magnolia leaf – as you can see, it was plopped on top of the grill after it was brought over and warmed up a bit. The sweetbreads were delicate, with the miso adding a nice richness to them. The squid ink rice had a nice depth to it, while the sweet – not particularly spicy – aioli rounded off each bite nicely. 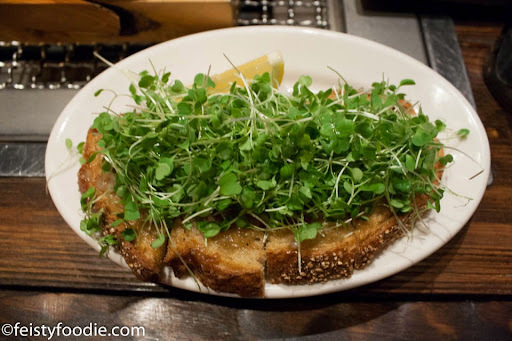 I enjoyed this dish, though it wasn’t my favorite – and tS seemed to enjoy it greatly. 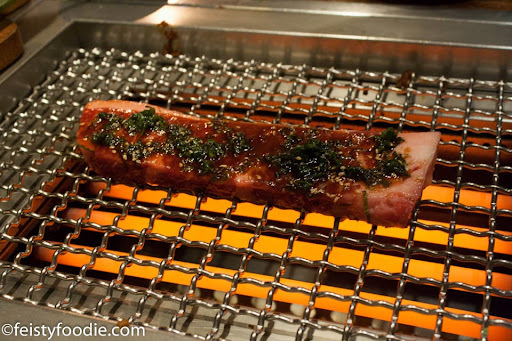 tS also chose – though I was quick to indicate my interest – 6 oz of Kobe beef. Look at that deliciousness – can you see the marbling on that beautiful slab of meat? Our server once again took over, cooking it very gently to a shade over rare, then sliced it for us with this super cool knife whose blade was in the shape of a cow that I failed to photograph. She suggested if we wanted it a little more cooked, we could put it back on the grill. Whatever was in that marinade was perfect, accenting the meat and cutting a bit through the richness without diluting its Kobe-essence. I thoroughly enjoyed eating this – though we both chose to cook our slices a touch more. Mm. Bone marrow and crawfish dumplings, which had boiling oil poured on top after being brought to our table (and after this picture), reminiscent of how I make Chinese style steamed fish (which has happened exactly once in my lifetime). I pause here to remind you how picky I am; people sometimes complain about this, and my answer is simple: if I liked everything, I wouldn’t be a very good food critic, now would I? That’s not to say I didn’t like this, but rather: are these dumplings? The tiniest whisper of what might have been dumpling skin existed, but mostly this was a big ol’ meatball. Which isn’t a bad thing, but a meatball vs. a dumpling are two completely different things. I love dumplings for what they are: juicy little meatwads wrapped in some sort of carby/starchy exterior that helps absorb the juices as they try to escape while I stuff them in my mouth. So: let’s take this as a bone marrow and crawfish meatball. On that level, they failed in a different manner: too dense, and the crawfish within broke up the monotony of the texture of balled up, cooked meat, but the overall flavor was completely flat for me. I didn’t see this as a repeat dish; conceptually promising, but failed to deliver on the wonder that I might find from marrow in a meatball or dumpling. 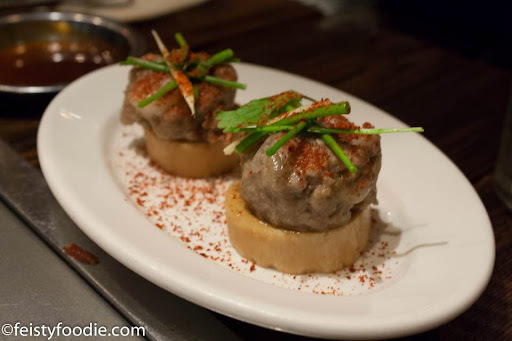 The presentation was gorgeous though – each meatball/dumpling sat atop a ring of bone, with the center completely hollowed and devoid of marrow. High on its own bone, it was a cute visual play that I appreciated, even if I couldn’t fully appreciate the meatwad on its own. Overall, I greatly enjoyed my meal at Takashi. While it’s by no means inexpensive, the quality and selection of very unique cuts that aren’t necessarily available everywhere makes it worth a trip – especially to those who enjoy offal and the “other bits” of the cow. I definitely recommend it for the adventurous among y’all! I feel obligated to mention that while tS is friends with the manager, I do not think we received special service – our server was attentive, friendly, knowledgeable, but I did not see her giving us preferential treatment in the slightest, she’s just that great at her job. I also feel obligated to mention that the manager does not know that I write about food (though he ostensibly saw my camera and could put dSLR + Asian girl together and get ‘food blog’), and that we received a fairly significant discount on our bill, though I don’t feel that affected my opinion for a lot of reasons. MEAT! Granted, I’ve never had Kobe beef, and the marbling does look good, I don’t know if I could ever justify the outrageous price point over normal, but good quality beef. I think I’d pass on the sweetbreads and brain too. You don’t even know how much that cost! You would justify it if you wanted to try it. More sweetbreads and brain for me! This place is so underrated. Really unique and delicious foods.